December 2017 - St. Croix and the Theatre dodged the bullet on Hurricane Irma - and while the Theatre suffered no damage from Maria, the rest of the island was not so lucky. But we’ve done a wonderful job of recovering - and when I was on island at the beginning of November - things were clearly getting back to normal. All power to our resort - and to Christiansted has been resorted - and almost all restaurants and bars and touristy spots are open and waiting to welcome you to our island paradise! You earned your vacation - You deserve the best - so you and your family deserve the Theatre on the Beach on St. Croix. A proud participant in HomeAway's Best Kitchen Contest! Come down and enjoy the absolutely amazing view - there is nothing between you and the ocean but 40 feet of white sand and 2 palm trees. We guarantee that when you open the door to the Theatre on the Beach - you will be blown away. After admiring the view - admire our stunningly beautiful Kitchen, Master and Guest Bedrooms, Master and Guest Bathrooms, and our Plus with it's hand painted Mural of Palm Trees. Just adorable. Granite counters, amazing amounts of storage in the kitchen, top-of-the-line stove, fridge, dishwasher, washer and dryer, and appliances. Central Air Conditioning - natch! Cooking with a view - why not? In the Master Bathroom there's a fab double headed shower - Massage heads on one side, rain shower with rain shower hand held on the other, granite counter tops (of course) - and a Toto toilet. In the Guest Bathroom we've gone old school - luxury relaxing tub, shower and massage shower head, and granite counter top. Check out the pictures... it's so lovely. Want more - you got it! Beach Towels, Beach Toys, Snorkle Gear, Games, Coolers, Changes of linen, Changes of Towels - all supplied - along with our oh so handy washer and dryer to keep things clean. More Fun at the Theatre - 60' HDTV with Satellite TV (over 200 channels), Blu-ray disk and DVD player - and now 2 fun Free Kayaks for you to enjoy - the Sunny Side - our Bright Yellow Tandam Kayak, and Yellow Frenzy - one person Kayak. What is our PLUS? It's our hidden extra bedroom with it's palm tree mural. Not only do you have an over-sized Master bedroom (with fab view of the beach and ocean), a lovely Guest bedroom with a queen sized bed and lovely view of our gardens, but there's an extra room with 2 twin beds - excellent for overflow - or just close the door - you are down to 2 bedrooms (with office space if you'd like). And if you are wondering where the name Theatre on the Beach comes from - its to honor our extensive Caribbean themed DVD collection. And a selection of my favorite videos if you want something besides Caribbean. Plus - we've have unlimited FREE high speed internet - bring your own laptop and the internet access is on us. So if you've decided on St. Croix - choosing the Theatre should be an easy decision! Called the Surprising Virgin - St. Croix is a wonderful mixture of the laid back character of St. John and the hub-bub of St. Thomas. And because it's large enough to have it's own farms and industry, prices are not outrageous! In fact, local fruits and vegetables are actually quite a bargain. Theatre on the Beach (unit 215) is located at Sugar Beach resort - just five minutes by taxi from Christiansted, but a world away from the noise, bars and nightlife. It's peace and quiet with an ocean front. Our 400 feet of sandy beach front means lots of room for everyone to play, our large free-form swimming pool beckons, and of course there's also tennis on site. 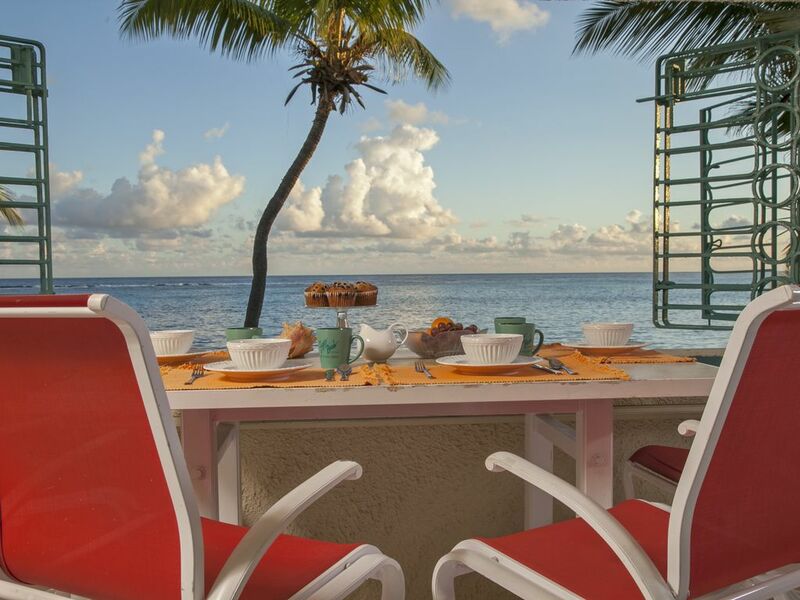 Our unofficially onsite restaurant - Breeze's - is one of St. Croix most popular - and it's open for breakfast, lunch, and dinner. Just don't miss trying a Mongoose - it's one of the most refreshing tropical drinks I've ever enjoyed. We've put in every appliance you can imagine, Gourmet kitchen utensils - upscale pots and pans - even Caribbean themed dishes are yours to enjoy. Even better, Theatre on the Beach has ceiling fans in every room - in additional to our central and super efficient AC system - not that you'll need it with the huge 30' private porch that gives you your amazing view of palm trees and ocean. Just drop us a line to check availability and make your reservation in Paradise! We wanted an island get-away forever - but most islands just didn't feel safe enough - that is until we set foot on St. Croix. This is the perfect island - it's US - and yet Caribbean. The ocean, the sun, the sand - all perfect - and yet there's a KMart, real grocery stores, even a Home Depot. You can visit a rain forest, a desert, and then the ocean. All within an hour. Perfect. Sugar Beach is right on the ocean. Nothing between you and the water but 40 feet of sand - and 2 palm trees. Plus it's fast and easy to get to Christiansted - adorable city with tons of great restaurants. We are seriously fussy about food - and these are seriously good. The View, the kitchen, the people, the place, the sun, the sea - it's all special. And we love it. Nothing between you and the Ocean but 40 feet of Sugar White Sand and 2 palm trees. Of course - life with out WIFI - just isn’t life. Even on a beautiful tropical island. And yes - it’s free. We are all about comfort, and multiple seating options. Sit inside to watch our huge 72” TV - or relax outside to enjoy the view. Your holiday, Your choice! Mutliple dishes for Multiple dinning options. Go for the cermic plates if you are all adults, or choose the fun flower high end Melamine ones for family gatherings. Award winning full kitchen with more cabinet space than you can imagine. All wood, All Granite, All beautiful. Over 3 granite slabs were needed. And of course - upscale everything. Huge 72” TV in the living room with top of the line sound system, and over 250 channels. You can even use the PVR if you’d like. And we’ve supplied lots of DVDs as well. Dish Network - every channel they offer. Blu-Ray player - and over 50 Caribbean themed DVDs to watch. Lots of games - my favorite is a scuba version of Monopoly! Our toy closet on the board is packed with fun kids toys - and there are even more in the Plus. And we’ve gone out and bought snorkeling gear for the entire family to enjoy. Sugar Beach is on several acres of lovely grass on one side of the condo - and of course our beach front on the other. 40’ long - and 20’ above the sand - so the view is stunning, and there is no blowing sand to deal with. Relax, Enjoy, Read, Use your computer - it’s your space, your way. We provide our guests with their own Kayak to enjoy. And the water in front of Sugar Beach is perfect for Kayaking - so do take her out for a spin. I’m not sure the difference between a deck and a porch - but we have you covered! Snorkels and Masks, plus assorted sizes of fins. Your family is good to go. There are 3 golf courses on St. Croix. Our lovely free-form Resort Pool is oh so lovely and oh so private. Fab decor, Central Air Conditioning, 60" HDTV Home Theatre with DVD's supplied - including a small but growing Blu-ray collection. Free use of Kayak to enjoy.